subsequently they went through more than 10 editions in some 20 years, not to mention innumerable adaptions and rearrangements in the course of the 18th century. 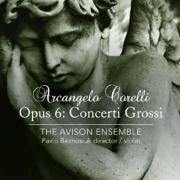 Often styled as the foundation stone of the concerto grosso medium, the pieces of Op 6 are structured around the opposition of solo concertino and larger ripieno groups of instruments, an arrangement that was already established in Rome by the time Corelli arrived there. The hallmark of Corelli’s style in these pieces is seemingly endless invention and variety of expressive means, and this is the main challenge in performance. In terms of recordings there is stiff competition here, with the now quite old if iconic recording of Trevor Pinnock and the English Concert well ahead of the field, but these new performances are certainly part of the competition, supple and elegant, perfectly in harmony with the suave if at times austere character of the music and, above all, architecturally shaped with subtlety and finesse. Improvised ornamention has been added with discretion and care, and the sense of ensemble is faultless and, in the faster movements, breathtakingly impressive.